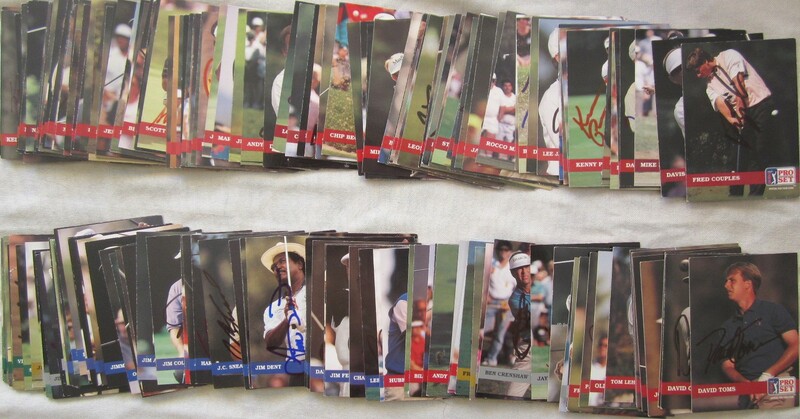 Lot of 175 different autographed 1992 Pro Set golf cards (various pens) including 51 cards signed by major champions: Fred Couples #1, Stat Leader #184 and Player of the Year #186, Davis Love III #3, Hal Sutton #9; Lee Janzen #20, Steve Jones #28, Steve Elkington #31, Tom Kite #32, Ben Crenshaw #38, Mark O'Meara #39, Paul Azinger #47, Wayne Grady #57, Mark Calcavecchia #61, Craig Stadler #63, Mark Brooks #71, Bob Tway #78, Fuzzy Zoeller #81, Corey Pavin #84, Larry Nelson #98, Jeff Sluman #99, Scott Simpson #103, Larry Mize #105, Ray Floyd #108, David Toms #156 (his Rookie Card), Tom Lehman #173, Hale Irwin Stat Leader #178 (personalized to Rebecca), Ben Crenshaw Stat Leader #183, Corey Pavin Stat Leader #185 (personalized to Greg), John Daly Rookie of the Year #187, David Graham #188, Jerry Pate #189, Andy North #190, Hubert Green #196, Lee Trevino #199 and Stat Leader #271, Charles Coody #203, Bob Charles #205 and Stat Leader #275, Gary Player #212 and Stat Leader #270, Don January #213, Al Geiberger #219, Lou Graham #236, Gene Littler #239, Gay Brewer #246 (deceased), Dave Stockton #258, Sandy Lyle #E3, Vijay Singh #E6 (his Rookie Card), Jose Maria Olazabal #E9, Bernhard Langer #E11 and Nick Faldo #E15. Also Hall of Famer Colin Montgomerie #E12. 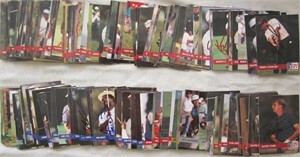 All autographs obtained in person at PGA Tour or Champions Tour events. With certificate of authenticity from AutographsForSale.com. Cards average ExMt/NrMt condition due mostly to corner and edge wear. ONLY ONE LOT AVAILABLE FOR SALE.